Pros: Excellent high-contrast image with vibrant colours and good detail across the exceptionally wide field of view. Very bright optics that perform well across a range of challenging light conditions. Great build quality and finish for the price: feel very solid, without being overly heavy and excellent balance makes them comfortable in use. Good close focus to 2m coupled with very wide field of view is great for fast moving insects. Cons: Bit more “grip” on the focus wheel would be better. Rain-guard attaches to opposite side of strap to normal, which takes a bit of getting used. Not really a fan of the “clip-in” tethered objective lens covers. Accessories could be slightly better quality to match the feel of the binocular. Price: GB£359.99 (c. €420) from Hawke UK (though you may find them cheaper elsewhere online). 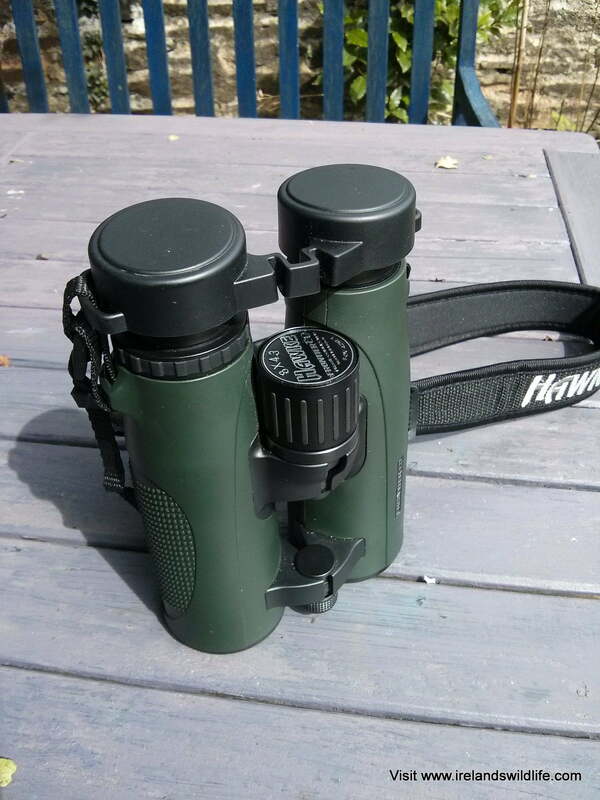 The Hawke Frontier ED is certainly a lot of binocular for the money. With a magnesium alloy chassis, ED glass, phase corrected prisms and fully multi-coated optics the Frontier ED combines many high-end features at a low-mid-range price… and that’s hard to fault. For the birding and wildlife enthusiast looking for the complete package, but without the budget to invest in the “big-guns” it’s a compelling package that’s hard to beat. The Hawke Frontier ED is an interesting binocular. It combines a lot of the high-end features typically found only on top of the range optics, and packages them into a robust, well made and well balanced open-hinge design at an extremely compelling price point. I was keen to see how well the high-spec-on-paper translated to performance in the field. The Frontier ED looks almost identical on the outside to the Vortex Talon HD I reviewed last summer. It uses an open-hinge design with two narrow bridges connecting the two barrels. When you pick up the binocular it feels solid and well made, and has the reassuring heft that any piece of quality optical equipment should have. There’s no getting around the fact that the Frontier ED are large even for full size 42mm bins — but that is often the case with open hinge binoculars… where the barrels tend to be longer to accommodate both hinges and still leave room for the all-important wrap-around grip. While they are large they are not bulky, and their balance is good. 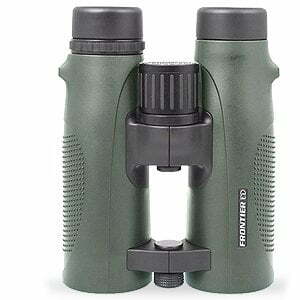 The Frontier ED is a very comfortable binocular to use. The body is well balanced, and the thumb indents on the underside of the rubber armour help encourage your hands to the right position without you having to think about it. The focus control is in easy reach and everything feels natural and seamless — which is exactly what you want when using a binocular. All of the mechanical components move smoothly and appear to be well engineered, with no play or “give” when turned, twisted and otherwise adjusted. The twist-up eye cups offer three possible settings (fully up, fully down with one intermediate step), and offer a very generous maximum eye relief of 18 mm, which is easily enough to offer a full field of view to practically any glasses wearer. They twist into position smoothly, and stay where they are when set. Overall the Frontier ED is well designed, with great balance and handling, and is very comfortable to carry and use in the field for extended periods. As you’d expect of any binocular at this level, the Frontier ED is fully waterproof and nitrogen purged to protect the innards from the elements and prevent internal fogging. When it comes to optical performance the Frontier ED is very impressive — not just impressive for the price… impressive: period! The ED glass, phase corrected prisms and fully multi-coated optics deliver bright, high contrast images with vibrant colours and excellent detail right across the wide field of view. There is practically no sign of chromatic aberration (colour fringing) during normal use, and it’s really hard to induce it even when you’re making a conscious effort. Colours are clear and largely natural, with perhaps a very slight warm bias which has no impact on the binocular’s effectiveness. A notably wide field of view is another plus point for the Frontier ED — at 142m/1000m (8.1 degrees) it matches or eclipses much of the more expensive competition in the 8×42 category. A wide field of view is great for scanning large areas like estuaries or expanses of open water, makes it easier to pick up and follow fast moving birds and other wildlife. The central sweet spot is large, and the image stays razor sharp well out towards the edge of the field of view, and only softening slightly as you reach the periphery. The Frontier ED delivered consistent performance across a wide range of viewing conditions — from peering into the murk of a shadowy hedgerow at dawn to handling the glare from strong directional sunlight bouncing off water — the Frontier ED kept on delivering. When the light fades the Frontiers keep going. Low light performance may not be on a par with the very best on the market, but they more than hold their own in their price bracket. Optically the Frontier ED is simply outstanding for the price, and compares very favourably to binoculars costing several hundred Euros more. I found the focusing on the Frontier ED a little stiffer than I’m used to, but not excessively so. The large focus wheel is easy to locate and turn, although I did find that the little raised rubber ridges didn’t afford quite as much grip as I would have liked. While it works fine in general, I can imagine missing birds or wildlife if you need to focus very quickly… especially if you’re wearing gloves. Around one and three-quarter clockwise turns takes you from a close focus of about 2 metres out to infinity. There’s good depth of field in the mid-range where you’ll spend most of your time looking to, which means you won’t find yourself re-focussing your binoculars incessantly — which can grow tiresome quite quickly. In practice around half-a-turn of the focus wheel will see you through the vast majority of viewing situations from nearby bushes to distant hillsides. The rest of the wide focus range is for fine tuning close-focus, making it easier to pick out the fine detail of nearby subjects. The dioptre adjustment is in the standard location just under the right hand eyepiece. It has numerous click-stops, is easy to adjust, and while it doesn’t have a locking mechanism the click stops and a relatively stiff action prevent unintentional adjustment once you’ve set it up. The accessories that come with the Frontier ED are pretty standard fare — there’s a padded faux-leather carrying pouch, a wide padded neck-strap, tethered objective lens covers that clip into recesses in the rubber armour below the objective lenses, and a tethered rainguard for the eyepieces that attaches to the strap (although it attaches to the “wrong” side of the strap compared to most other binoculars… something that takes a bit of getting used to at first) and a cleaning cloth. On balance the accessories are fine, and they do their job, although there is scope for some improvement, particularly with the strap, which while functional could do with a bit more padding. Hawke offers it’s worldwide Limited Lifetime Warranty on the Hawke Frontier ED — which covers the product for any defects in materials or workmanship for the lifetime of the original owner. The Hawke Frontier ED delivers incredible optical performance for the price, and represents excellent value for money. Are there better binoculars out there? Are there better binoculars out there for less than €400… that’s a much tougher question to answer — and there are some really good contenders out there — like the excellent Vanguard Endeavor ED I reviewed last year — but if you’re shopping for binoculars in the €300-€400 price bracket you’d be crazy not to have the Hawke Frontier ED on your shortlist. 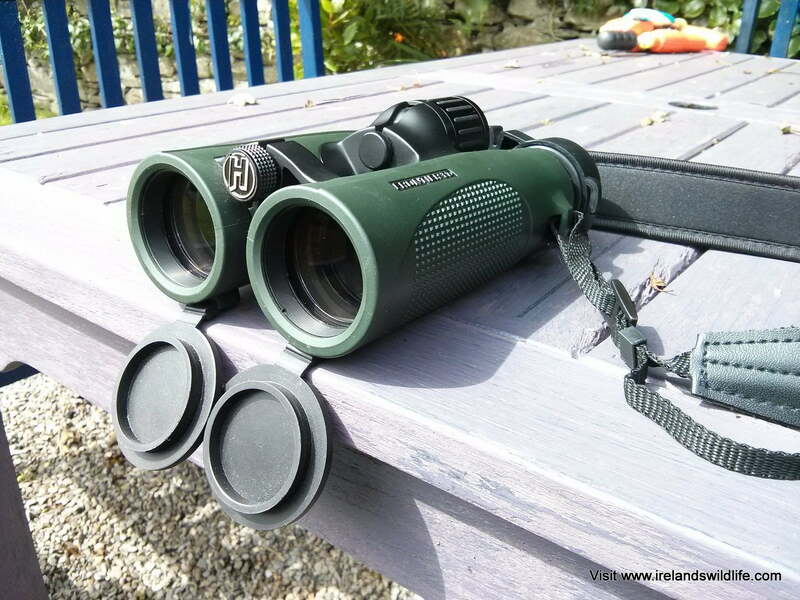 I’d like to thank the folks at Deben, Hawke Optics’ UK and Ireland distributor, for submitting the Frontier ED 8×42 for review on Ireland’s Wildlife. NB. Ireland’s Wildlife has no specific affiliation to any optics or gear manufacturer and all reviews on the site are completely independent and objective. If you’re an optics or gear manufacturer and would like to submit your product for review on the site please drop us a line using the contact form and we can take things from there. i gave serious consideration to buying a pair of these after reading this article, but didn’t buy them – the main reason being that if i’m going to spend a non-insignificant amount of money on something like this, i would want to manhandle them first. they do not seem to distribute to any retail stores in ireland. It’s one of the big challenges in terms of buying optics in a comparatively small market like Ireland, Kevin — finding retailers who stock a good variety of brands that you can try “hands on”. 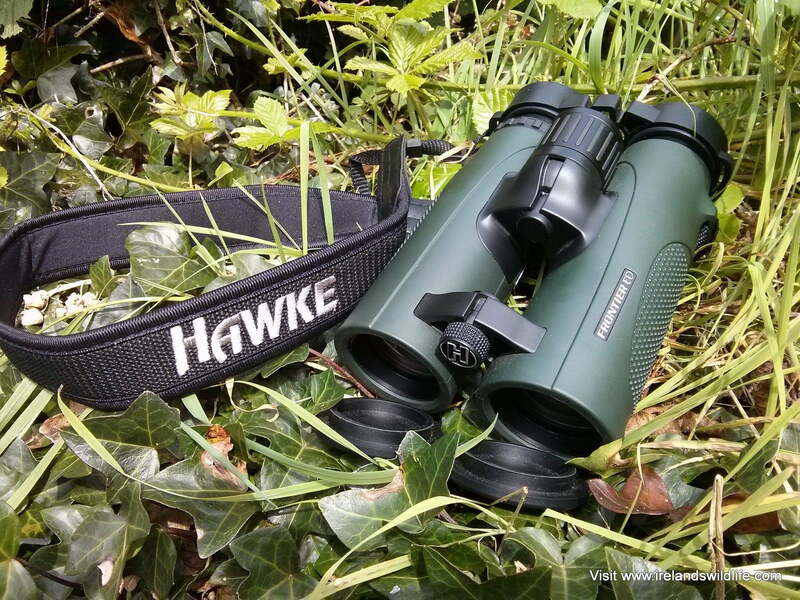 The Hawke Frontier ED is an excellent binocular for the money, and boasts a feature set / performance that would typically cost a lot more — but I appreciate it’s a bit of a gamble spending several hundred Euro without giving them a try for yourself. I do know that Deben, Hawke’s UK and Ireland distributor, is looking to stock products with Irish retailers in the not too distant future — so hopefully there will be somewhere near you stocking these before too long. Hi Kevin, I believe you’ll now find Hawke optics in stock at a number of camera stores and optics retailers in Ireland. They’re also being stocked in the Birdwatch Ireland shop at their reserve in Kilcoole, Co. Wicklow — where you can try them out. Did you find the focus wheel on these a bit laggy? I tried a pair and felt like I had to move it a long way before it actually engaged and moved the prisms. Wondered if all of them are like this, or whether it’s a QC issue. No David… can’t say that I experienced any lag in the focus. It was a fair bit stiffer than I’m used to, as I mentioned in the review, but apart from that I didn’t experience any issues with it. Also haven’t seen this kind of issue with other Hawke models, so guess it’s just a fault — I’d recommend returning them for repair / replacement under warranty if you’re unhappy with them.